I guess I am just the biggest damn idiot in the world. I don't know nothing, I'm just a dumb rancher that learnded nothing and need to be told everything. A comment on my recent post, More Snow, elicited a comment from somebody who doesn't want to leave a name that tells me how to calve and how to doctor scours. I guess my many years in the business hasn't taught me anything and anonymous people now need to give me the information that this dumb rancher who can't think his way out of a paper bag obviously can't figure out on his own. 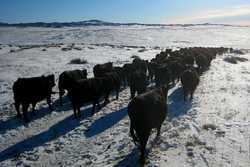 To start with I am advised to use something called the Sandhills calving system. A coursury examination of the information shows me that this calving system is based on the same idea as rotation grazing. New calves aren't infected by older calves because you are always moving the cows that haven't calved. So, how much would a system like this cost me to implement? Can ever so helpful anon answer that? This would require many miles of fence at somewhere over $8000 a mile and more water wells that I don't have to provide clean fresh drinking water, which my experience has shown me to be a big participant in preventing scours, and I don't know how much more infrastructure to implement this system. I estimate that this system would cost me around $150,000 to even attempt to try. That just doesn't even begin to pencil out around here with no more problems than I have. I might complain a little once in a while when there is a storm but my problems now are minor. How about this for a lot cheaper and easier idea. Why not calve your cows in a big pasture, 2000+ acres, where the cows natural instinct to move away from the other cows when she calves keeps her young baby out of contact with other calves. Such a large pasture provides numerous water holes and lots of space for the cows and their calves to move away from one another so that the chances of disease transmission is slim because there is no close contact on a continued basis. The only problem with this is when you get a bad storm in the middle of calving and the cows and calves bunch back up together you can have a little scour troubles because of the bunching. No, this cheap and easy solution to the problem would never work now would it anon? A dumb as dirt rancher thought it out, they don't have a brain so how can they think, not a University full of Professors that have money to build and study these things like the Sandhills calving system. As for the article on doctoring sick calves, I've more than likely forgot more about doctoring sick calves than the authors of the article will ever know. I didn't see anything I didn't all ready know. I know I'm a little cranky right now so I might have come off a little mean here and for that I apologize but the comment just really struck a wrong nerve with me. I know someone is trying to give me good advice but I'm in no mood to hear it. I get tired of these University people telling us how to do things. They always assume we have the same unlimited amount of money they do to do these things when in real life the costs of some of these things are just outrageous and won't work in the real world. The only way they work is if rich people come in and buy ranches up and run them as play things. Then they pick up these ideas and run with them telling us traditional ranchers who are struggling to make a living at cattle production, not making a hobby out of it, how stupid we are. Most of us that are left surviving today aren't stupid. We have found something that works for our operation at a minimal cost so we can make a living. I don't see how this Sandhills calving system can be economical for the average rancher. I wouldnt give you a plug nickel for University advice!! I often wonder where they come up with these ideas! Ouch. That you are an idiot or dumb rancher is absolutely not what I was thinking, meant or intended. Please accept my sincere apologies and thank you for the lesson. We use the same system you do and it works quite well too! We did moved our calving date back to the 1st of April but we're in the midst of a foot of snow and I've seen it snow more even in May. All the best!